Isshin had previously lost his powers and only recently did his powers return. 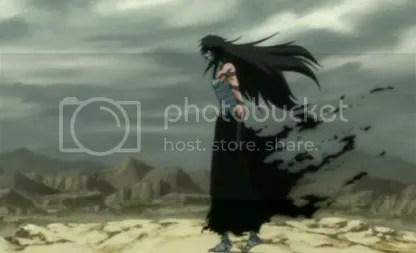 It can be assumed that he had at some point used the ‘Final Getsugatensho’ and became Getsuga. I really didn’t expect for Ichigo to use the technique and as a result lose his shinigami powers. I guess this opens up the path for a new story to begin. There was also that one thing that Aizen talked about– the Soul King. During that exchange of dialougue between Aizen and Urahara about the Soul King, for a moment, I felt that Aizen may have been doing something good but just didn’t approach it with the right methods. I want to talk about Aizen’s defeat really quick. 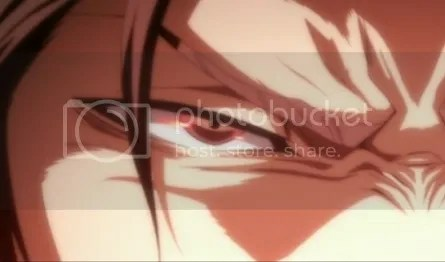 I feel everything that has happened before used to lead up to this final moment of Aizen’s sealing had been dragged out too long or that his defeat was just too quick. I expected for him to last a while longer and not be defeated in just an episode. Besides, it just didn’t really feel right to have him defeated because he was sealed. It’s kind of lame to me. Aizen’s slowly lost his composure and started talking a lot more than usual. Before, he just looked calm, cool, and conserved. 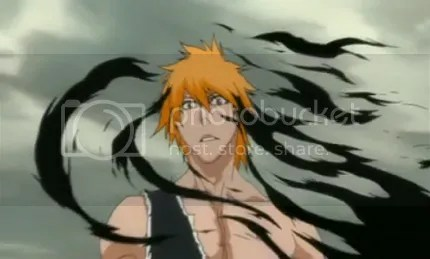 During his fight with Ichigo, he just completely lost it and let his emotions free. Not saying it’s bad but just different from his usual self. –Hold on, if he’s sealed, there’s a chance for him to be unsealed in the future, right? I hope this is the end of Aizen… The show’s focused so much on Aizen that I’m kind of sick and tired of seeing him even if he was fun to watch when he gets all dramatic– melodramatic. At first, seeing the final form, I was just speechless and overwhelmed with awe but then I became a bit sad because it meant that he was going to lose his shinigami powers. His powers take part in making him who he is and for his powers to disappear, it’s as if a part of him is taken away. It was also sad how all Tensa Zangetsu wanted was to protect Ichigo and not being able to do so because he would disappear or die… Does that mean that the Hollow Ichigo and Tensa Zangetsu die? Do they not exist when Ichigo loses his powers? 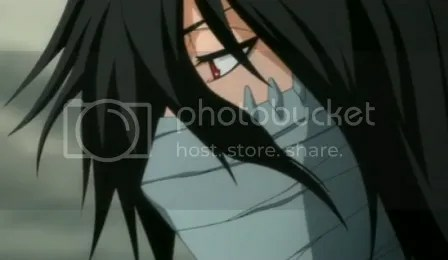 A question.. Before transforming and using the final form, he had his sword wrapped around his arm. Is there a special meaning to that? I’m thinking that it was there to allude to the fact that he was going to become one with his zanpakutou. 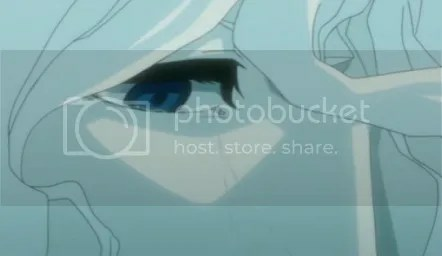 One more thing– The BGM was just amazing, greatly amplified the scene, emotions, rush of adrenalin, and the situation. OMGGG, Ichigo looks so damn cool in his final form. Seriously, right when I saw it, I kept thinking ‘DAAMMNNN, he looks so good. *_*’ Lol, the same thought I had last week. I wouldn’t mind if he stayed in his final form forever because that’s how much I like it. Well, I should go to bed now but… I still so excited, I don’t know if I’ll be able to sleep, hah. 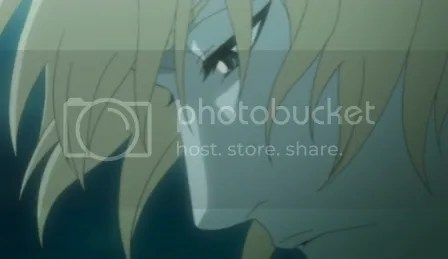 Sorry, I couldn’t help myself… I kept taking screen shots of Ichigo because he looked so cool. and, and I usually try not to write that much but I couldn’t help it this time… I had so many thoughts after watching this episode. Ahh..so the anime has finally reached this part. It’s a pity that Ichigo lost his Shinigami powers but I’m confident that he’ll gain them back. Hmm..I didn’t realize that his hair turned black during this transformation. Well, maybe that’s cuz the manga is black & white -_-. It wouldn’t be Bleach if Ichigo lost his powers forever; It’s just a matter of time. I hope it won’t take eternity for his powers to return. Lol, that is why you should watch the anime too to see the colors. I hope they don’t neglect his past; I want to know what happened to the Kurosaki family from the beginning. How did Isshin end up with Ichigo’s mom if she’s a human. I’m also curious about Ishida’s dad and how did he and Isshin end up as acquaintances. Oh yeah – I totally forgot about Ishida’s dad. It looks like there are a lot more history to reveal itself. I think his dad’s pretty hot but the white hair makes it feel as if he’s really, really, really old. Haha I think the anime is really close the manga right now.. so I think we’re going to get some filler episodes soon.. or maybe a possible filler arc. NOOO, ugh, it was getting good and I’m really tired of fillers. I wouldn’t mind if it was something similar to the Zanpakutou arc because at least it was nice to see their materialized forms. If they’re going to do a filler arc, then it should be connected to the main story somehow. If I knew earlier that the Bount Arc had nothing to do with the main story then I would’ve have skipped it and saved time. I don’t really want to watch the next episode because I’m still amazed by the action and stuff from this episode and seeing the previews, I don’t see anymore action. T-T I’m going to miss the fights and tension. I wish I could’ve skipped. I didn’t think of skipping because I thought I would’ve missed something important. Haha I’m glad I skipped it, since everyone else told me how boring it was . .____. I’ve been procrastinating alot lately, well I guess because it’s almost the end of the school year with testing and stuff they try to give more work to get us ready or something. Ahhhhh stupid me -_- ignore that, that was one of my other accounts. What? Lol, you have to take summer school? why? haha, is it because your failing? Tsk, tsk. I felt the same way about Aizen when he mentioned Soul King thing, poor guy, but then again, he did go about it in a very wrong way. I would argue that Aizen was in his own way just trying to be free of the Soul King, but the fact that he didn’t choose to run away and instead chose to fight shows that he never did get free. The Zangetsu bit was really sad, it kind of shows that no matter how strong you are in the end, you always need someone to protect you as well. 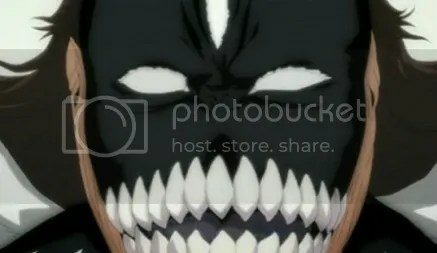 I don’t know if the anime will have fillers or not (but they are likely), but after the fillers, the new arc will start, and it is a good deal different from the past couple of arcs, it reminds me of the old Bleach, in a good way, so yeah, it should be fun. Lol, I didn’t think it would be that awesome. ahah. 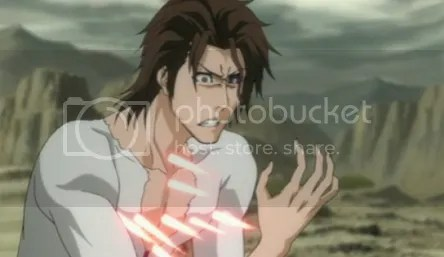 Ever since that scene, I’ve changed my opinion of Aizen a bit but he did sacrifice a lot of lives. It’s kind of contradicting in a way. He seems to have had good intentions but were twisted as he trotted down his path to freedom. It makes me wonder if they’ll ever show the Soul King and why Aizen wanted to fight against such a figure. I guess he wasn’t strong enough to reach the Soul King. Since Zangetsu’s gone, no one will be protecting Ichigo and Ichigo can’t really protect anyone else since he’s become a normal mortal now. After so much that has happened I hope they don’t give this arc a lame ending because it would just ruin it. I’m hoping for a nice wrap up and transition into a new arc. I hope and pray that the fillers won’t be so bad and that I would enjoy them. Maybe I’ll start reading Bleach if there are fillers before the start of a new arc. I just watched the last 2 episodes, and I would have to agree, the BGM is amazing, I also really liked the use of some nostalgic themes (like the Zangetsu theme). The conclusion to this arc isn’t bad, but it is kind of sad though, many people thought the conclusion was also the conclusion of the manga, but it really wasn’t. There isn’t much of a transition, but the next arc has a good beginning. Omg, I just can’t get enough of the BGM and the subtle vocals. … wait, what? The ending to this arc is different from the ending of the manga? Is there a lot of difference? Which do you like better or do you think was more powerful? Do you know which chapter it starts on? I think I’ll read it. I heard that the arc, in the manga, was really boring and not much happens for the first few chapters. Things have just shimmered down drastically or so I’ve heard. Sorry for the confusion! No, what I meant was that people thought the manga would be ending after this arc, the ending to this arc is the same as the manga’s. When I said sad, I meant sad as in the conclusion will be sad, the tear jerking kind of sad. The reason why some people don’t like the next arc is because there is no action in the first couple of episodes, for a while it is really just a “Slice of Life” story. I enjoyed it, but I guess if you need your dose of action, it would probably be a bit boring. So you meant that the way that this arc ends with how things are left -Zangetsu, Aizen, and Gin dying and whatnot- was sad? It doesn’t really feel as if Bleach is going to end anytime soon… He has got to regain his powers before it all ends because that’s what Bleach is essentially about, a dude with shinigami powers. Maybe the slow pacing and no action kind of storytelling might be good once in a while to clear and smooth things out. T-T I don’t want anymore fillers… I was catching up on Naruto Shippuuden and OMG am I tired of fillers. Same here, I barely even have time anymore.. I didn’t even get to see a lot of the shows for this season… I’ll have to watch them over Summer. I’m thinking of waking up early just so I can watch anime, ahah. Wow, they caught up to the manga pretty fast. i lost interest in bleach after he lost his powers. The fillers aren’t even interesting. It’s sad to say so but they’re lame. Eventually he’ll have to get his powers back… are you going to pick it up again once you hear about his powers returning? Well, regardless of whether or not he’s taking advantage of the series through monetary means, I don’t want it to end. I really love this series despite the fillers and such so I would hope for it to continue forever but that’s impossible. So, it should drag on as long as it can because it’s gotten past the point where it can find a good stopping place to end the series where most would be satisfied with. Hmm, I think what happens is that Ichigo fights Grimmjow, beats him and than moves onto Uliquiorra. 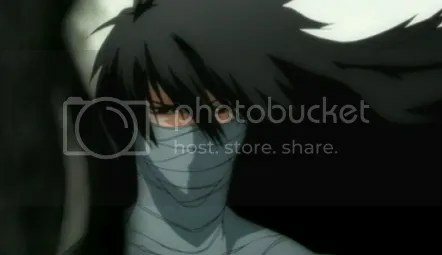 They fight and get beaten then Ichigo goes back to the real world to save Karakura Town from Aizen because while Uliquiorra was fighting Ichigo, Aizen planned to use Karakura Town and it’s residents as sacrifice to make a key. The key would lead him to the Soul King. —Did you want me spoil all of it for you? If you want, I could try to find the episode for you so that you can watch from there.